Text: … For the Brixtonian, Brixton is clearly the hub of the universe. There is a large railway bridge which bears to the Brixton landscape the same relationship that St. Paul’s bears to Cheapside. But I am convinced that the Brixtonians regard their railway bridge as a thing in itself and serving no purpose save the ornamental. That train should use that bridge to convey people to other parts of the world seems unthinkable There is no other part of the world that matters. These things being so, it was obvious that Brixton must be provided with a cinema equal to any of those which, if the worlds of travellers might be believed, had been erected on the other side of the big river. But what Brixton wants, Brixton has, and that was why we alighted at a building which was certainly much less of an eyesore than, for example, the Regal Picture Palace, the exterior of which I take to be the biggest blot on the new London landscape. At the same time the architect had made a great mistake in despising the side street down which half his building runs. For this side street, which has no façade, is just as visible as the main Stockwell Road which is plentifully bedizened, with the result that the visitor receives the impression of a building only two-thirds completed. Inside, of course, completion has done her utmost. In the entrance-hall there is a running fountain in whose basin may be seen, disporting themselves, gold-fish, numbering, as Mr Belloc used to say in the old war days, more than fifteen and less than thirty. Marble stairs, lusciously carpeted, lead the giddy visitor into an auditorium alleged to resemble an Italian garden. Stars twinkle; fronds fan the fevered forehead, and, what is more important, the seats are admirably cushioned. The place is one of extraordinary, almost Babylonish magnificence. Tea-lounges abound. There are cubicles where the jaded shopper may repose; and wherever marble has a right to be, there marble is. The Directors, whose mobile, eager, and pleasantly acquiline features decorate the handsome souvenir with which the management presents you, have obviously not demanded any change out of their capital expenditure of £250,000 and will be satisfied, I imagine, with a return of something like 1000 percent on their money. I am not very good at figures, but the house holds over four thousand people at prices from sixpence to three shillings and sixpence, and there are three performances a day, at all of which up to now the house has been crowded out. Well, that is good business, but not better than such enterprise deserves. I guessed correctly the number of charwomen employed, to which must be added twenty-four brass cleaners. I was, however, £8000 out in my estimate of the organ. The instrument would appear even to the unskilled as a noble one, and fit for the performance in the best cinema manner of pieces written for the piccolo, pianoforte, and every instrument except the organ. On the afternoon that I attended, Mr Pattman played a selection from “Peer Gynt,” which I shall say, with bated breath, needs that drama to jog it along. But the reasons why I intend to be outrageously and unfairly favourable to his picture palace are, first, that it has not wholly gone over to the talkies; and second, that it has retained a first-class orchestra, the excellence of which has been made possible by the poltroonery and short-sightedness of those West End houses which have dismissed their orchestras. It is true that there was a talkie on that afternoon, but I took advantage of this to inspect the lighting plant, the drains, and the strictly business side of the venture. The talkie being over, I saw an admirable silent film about a New York journalist. “Get your street scenery on,” said that journalist to a chorus girl. “You’re going up town with God’s gift to literature!” But he had the sense to say it in a sub-title. While Mr Haines was delivering himself of this amiable nonsense, the first-class orchestra played Offenbach’s “Orpheus in the Underworld” Overture, Dowling’s “Sleepy Valley,” Montague Phillips’ “Arabesque (a piece I didn’t know), “Oh, Maggie, What Have You Been Up To?”, and if I mistake not, “The Lost Chord.” And I hereby announce that in the bosom of one cinema fan there is more joy over chords that are lost than over tongues that are found. Comments: James Agate (1877-1947) was a British theatre and film critic. 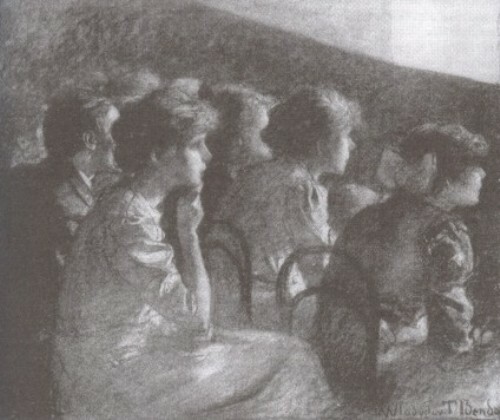 His film reviews, mostly written for The Tatler, often mention the cinema in which he saw the film. The cinema described here is the Brixton Astoria, London, built in 1929 and now the Brixton Academy. The architect was Edward A. Stone. The film about a New York journalist was Telling the World (USA 1928 d. Sam Wood), starring William Haines. This entry was posted in 1920s, Journals, United Kingdom and tagged Audiences, Cinemas, Intertitles, James Agate, London, Music, Musicians, Organs, Performers, Prices, Seating, Staff, Telling the World (1928). Bookmark the permalink.